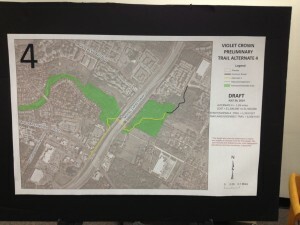 Last update on Tuesday, March 24, 2015 at 1:00 p.m.
03/24/15 email update from City of Austin to VCT mailing list: Recommended route has changed "...in light of the upcoming Mopac Mobility Bridge Project to Slaughter Lane. 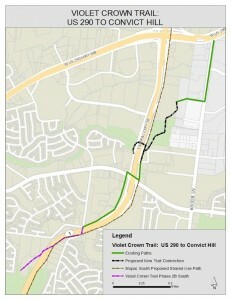 During this time, the City of Austin will move forward with designing the first segment of this portion of the trail (see black dashed lines in the attached map) from Home Depot Boulevard to Williamson Creek, extending to connect to existing sidewalks on the east side of Mopac, and extending westbound under Mopac and up to the rear parking lot at the Randall’s." 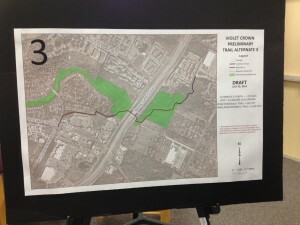 The City announced that the recommended route is Trail Alternate #3 which passes along Westcreek's boundaries. There is also a "sub-alternate 3a". Please see the city's email announcement for more information. Please note: City of Austin hosting a Public Meeting to discuss this further & answer questions on Tuesday, January 13, 2015 at the Hampton Branch Library, 5125 Convict Hill Road, Austin, TX 78749. The section of the Violet Crown Trail from Home Depot Boulevard to the Arbor Trails Development is in the Preliminary Engineering Phase. Staff is working with an independent wildlife biologist to investigate any potential impacts alternative trail alignments may have. The Preliminary Engineering Report, with this additional information, will be available for public review on our website (www.austintexas.gov/urbantrails) by mid-December. This report will include the trail alternate choice (#1, #2, #3 or #4). Alternates #1 and #3 are routes that are bordering or close to Westcreek. The next meeting on this section of the trail will be at the Hampton Branch Library (5125 Convict Hill Rd, Austin, TX 78749) on Tuesday, January 13th from 6:30-7:30 PM. There will be a brief presentation followed by a discussion and opportunities to provide written and verbal feedback. Those who cannot attend can send their comments to Urban Trails Program Manager Nadia Barrera at nadia.barrera@austintexas.gov. It is estimated that construction of this section will begin by early 2016 and will complete by the end of 2016. *A full email with additional information was emailed to the Westcreek mailing list. Received a status email from the City advising that the trail alternate choice and the next public meeting are anticipated to be ready in November 2014. The reason for the delay is that the City staff are hiring independent professionals to assess wildlife, tree and cultural impacts for all four alternatives before a final decision is made. This requirement is a part of the recently updated Urban Trails Master Plan and the city is following the new requirements as they go forward on the Violet Crown Trail. 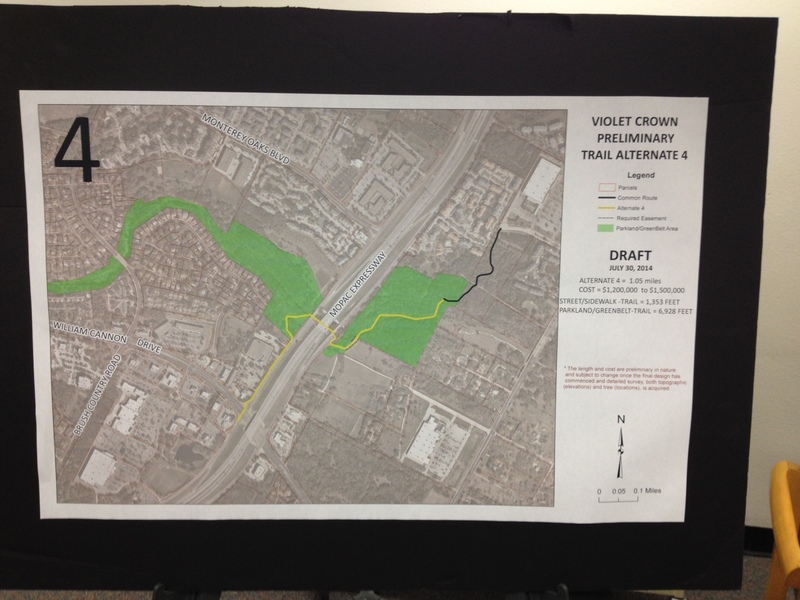 "Currently, an independent firm is working to provide a preliminary analysis of wildlife, tree, and cultural impacts of the four proposed alternatives for the phase of the Violet Crown Trail from Home Depot Boulevard to the Arbor Trails development. “Include an independent, certified wildlife biologist or ecologist as part of the design and construction team for each Urban Trail." "An independent, experienced wildlife biologist or wildlife ecologist qualified in ecological assessments and an experienced, certified arborist will be included as part of the preliminary engineering team for all Urban Trail projects. Prior to beginning 30% design, the project team will determine if these two persons shall be part of the team throughout the process, including selecting the options for the trail route (initial trail conceptual alignment), providing criteria to protect trees, riparian areas, and habitat and wildlife corridors, participating in trail design, and overseeing installation." City staff to brief the Environmental Board and any other appropriate Boards and Commissions for their review and recommendations to Council. City staff to present each proposed Urban Trail (at 30% design) to City Council's Comprehensive Planning and Transportation Committee, or its successor committee, prior to any decision being made about the trail route, and in ample time to change the route. As part of the Council Committee presentation, staff will consider trail alignment; trail surface material; environmental aspects such as critical environmental features, trees, slopes, etc. ; community concerns that have been raised; as well as any other project specific issues. The Council Committee will make recommendations to the City Council as needed. If issues related to a proposed Urban Trail need to be raised to the City Council level, this would be the vehicle for doing it. It would become a City Council decision whether to proceed with the staff recommendation or not on a proposed Urban Trail. Citizens will be addressing City Council members with their concerns and Council will be directly accountable to those citizens. Each project will have its own website to facilitate transparency with the public. The project website will contain media information, maps, exhibits, contact information, and the draft preliminary engineering report once it is available. Once the preliminary engineering report process is complete, a secondary open house will be held to present the preliminary engineering report to the public. 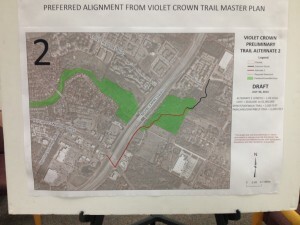 The Violet Crown Trail master plan currently shows no connection around Westcreek. Apparently, as trail planners started looking at the segment around the William Cannon & Arbor Trails & Mopac area, planners proposed alternate routes for this particular segment. 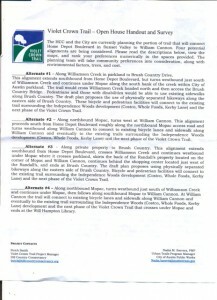 A few of the proposed alternates utilize more of the Williamson Creek greenbelt areas that border Westcreek and certain Westcreek streets, specifically Yellow Rose Trail, White Elm Drive, Sanderson Avenue, and Myra Court. 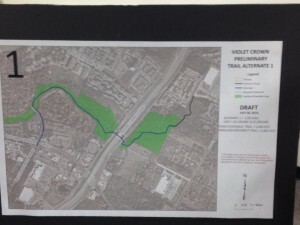 The City of Austin Urban Trails Program hosted an open house at the Will Hampton Library on Wednesday, July 30, 2014 to unveil four (4) proposed trail alternates that would connect to the larger Violet Crown Trail, which will run from Hays County to Zilker Park. The WNA was approached by the city ahead of the meeting and was asked to let neighbors know about the July 30 open house. The WNA sent an email out to all on our email list and posted notices to our Facebook and Westcreek Nextdoor sites to let neighbors know of the upcoming meeting. What Was Presented at the Open House? The following four (4) alternate routes were unveiled at the July 30 meeting. From information gathered since the meeting, it is our understanding that the proposed urban trail would be 12 feet wide (ADA compliant) and composed of concrete with 2 to 5 feet cleared on each side. The City of Austin has launched a website page on 8/11/14 for you to visit, review information and provide feedback. CLICK HERE FOR CITY'S WEB PAGE & SURVEY. If you were not able to attend the July 30 meeting, this will be a good opportunity for you to weigh in on your preferred trail alternative and give any other comments. Please be sure you are signed up on the Westcreek email list to be sure we can reach you with updated information. Since the Open House, WNA Board President Voss has been communicating with city staff to find out additional information and we are updating this page as we find out more. A few neighbors who live on Yellow Rose Trail have met with a city staff member to discuss some concerns. Notes summarizing that meeting are available here. October 2014 - Likely the next Open House. If an option is chosen at that point, a presentation. Post October 2014 - If option chosen at this time, city begins work on a Preliminary Engineering Report (PER) to determine if chosen route is feasible. Design and construction start dates depend on which route is chosen. Any trail going through a creek area would take much longer to analyze for feasibility. What Are the Four (4) Alternatives Being Presented for Public Input? Runs into outskirts of Westcreek along the Randalls greenspace and near/bordering Myra Court and Sanderson Ave.